The VacQPack system changes how dry goods are shipped by combining low pressure, low oxygen, and temperature monitoring to create a preserved space for shipping commodities. 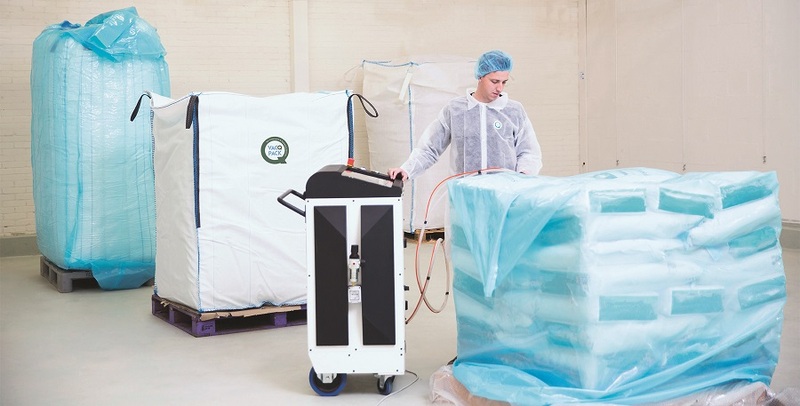 The combination of low oxygen and low condensation in the VacQPack system increases the length of time that dry goods can be stored without spoilage. By some estimates, dry goods stored using VacQPack last up to four years longer than traditional methods. The system also improves resistance to oxidation, color change, and undesirable taste changes – all without the use of pesticides. Goods shipped via VacQPack are first wrapped in an airtight bulk liner. The VacQPack system removes oxygen, leaving a low-oxygen blend of inert gases carbon dioxide and nitrogen to act as a biotreatment against infestation and oxidation. Once the product is sealed, the climate-controlled storage package also prevents condensation and mold growth during overseas transits. VacQPack is a spin-off of EWS Group. It was created to be complementary to the pest control services of EWS, serving its customers with biotreatment solutions. VacQPack uses modern techniques to treat and preserve high-value commodities in bulk packaging. It specializes in dry food, combining vacuum and environmental control techniques to minimize spoilage during transit. It can be applied to most dry solid products, as well as powders in agricultural, pharmaceutical, and chemical sectors.